Photograph © Rodney Barton. Used with permission. Inspired by the creation of a National Garland of Flowers for the 1893 World's Fair in Chicago (World's Columbian Exposition), the "flower or bloom" of the magnolia (Magnolia grandiflora) gained support as state flowers of both Louisiana and Mississippi around 1900. Louisiana adopted the magnolia as their official flower in 1900. Mississippi however, whose school children voted for the magnolia in 1900, took no official action for 50 years. Mississippi finally adopted the magnolia as the state's official flower in 1952. 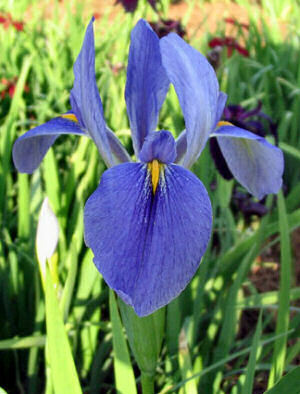 In 1941, the Mary Swords DeBaillon Louisiana Native Iris Society was formed by a group of Louisiana iris enthusiasts. In 1948, the group changed its name to the Society for Louisiana Irises. The Society, its membership having grown to about 185 members, proposed legislation, in 1950, to replace the magnolia blossom with the Louisiana iris as Louisiana's official state flower. In an effort to appease the magnolia supporters, legislation was also proposed that would make the magnolia the official state tree. An attempt was made to have the Louisiana iris voted the State Flower of Louisiana, but it was blocked by supporters of the magnolia and of an elderly woman who made her living by painting and selling magnolia pictures! Our proposal was that the magnolia would become the State Tree. "Lots of people already think that everyone in Louisiana lives in houses on stilts in swamplands and keeps an alligator as a watchdog." An elderly woman who made her living painting and selling magnolia pictures testified for the magnolia. Iris supporters thinking that they were promoting a more practical nominee, contended that the native Louisiana iris can be grown everywhere and that the magnolia, grown throughout the south, is not unique to Louisiana. There was an expectation that redesignating the magnolia as the state tree would placate magnolia supporters. The Society misjudged the appeal of the magnolia, however, and the magnolia retained its position as state flower of Louisiana as it does to this day. "I was proud of the fact that our crowd made a dignified, logical presentation of the facts, based on an appeal to reason, and devoid of criticism of the magnolia or sarcasm directed at those who supported it. The reverse was true of our opponents. Their appeal was purely emotional; many of their statements were not factually correct, and they directed ridicule at our native iris and all those who would champion its official recognition as the state flower." But the Louisiana iris would be back. As a popular native of Louisiana, it's beauty and stature made a comeback almost inevitable. The Louisiana iris (Iris giganticaerulea) was made the official state wildflower of Louisiana when Governor Buddy Roemer signed Senate Bill No. 16 on July 18, 1990. Forty years after its initial attempt at Louisiana officialdom, the Louisiana iris had its day when it was designated the official state wildflower of Louisiana by legislative Act No. 511 in 1990. Louisiana iris are comprised of five native species; Iris hexagona, Iris brevicaulis, Iris fulva, Iris nelsoni, and Iris giganticearulea. Current hybrid Louisiana iris have resulted from hybridizing the five native species. Very often, legislation naming "official" symbols with biological roots is not very specific, neglecting reference to scientific names of any sort. In 1990, the Louisiana iris was made the official state wildflower. The statute indicates that only one species, Iris giganticearulea, can be considered the "official" wildflower of Louisiana. In addition to an official wildflower, Louisiana has also adopted an official state flower as mentioned above. The following information is excerpted from the Louisiana Revised Statute , Title 49, Part 8, Section RS 49:154.1. Title 49 - State administration. PART VIII. STATE SYMBOLS AND DISPLAY OF FLAGS. There shall be an official state wildflower. 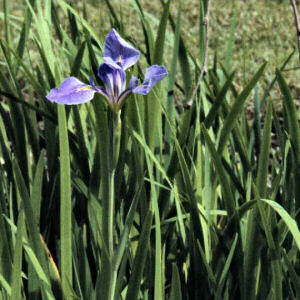 The official state wildflower shall be the Louisiana iris (Giganticaerulea). Its use on official documents of the state and with the insignia of the state is hereby authorized. Acts 1990, No. 511, §1. Caillet, Marie. "Marie's Scrapbooks." Society for the Louisiana Iris . Society for the Louisiana Iris, n.d. Web. 22 July 2005. from the Society for Louisiana Irises Bulletin #143, March 1991. Louisiana Revised Statutes, (http://www.legis.state.la.us/), July 22, 2005. The Society for Louisiana Irises, (http://www.louisianas.org/), September 27, 2005. Iris giganticaerulea Small (giant blue iris): USDA, NRCS. 2004. The PLANTS Database, Version 3.5 (http://plants.usda.gov). National Plant Data Center, Baton Rouge, LA 70874-4490 USA. Iris giganticaerulea Small (Giant blue iris): from Rodney Barton, The University of North Texas Health Science Center. Society for Louisiana Irises: Website of the Society for Louisiana Irises. History of the Louisiana Irises: Articles by Tom Dillard (Malvern, Arkansas), by Marie Caillet (1985), and Caroline Dormon from the pages of the Society of Louisiana Irises. The Species of Louisiana Iris: Zydeco Iris Gardens, Metairie, Louisiana. Louisiana Iris Pamphlet : LSU Agricultural Center: Louisiana Cooperative Extension Service. Information on culture, watering, fertilization and several other topics. Louisiana Iris: Article about blooming irises in New Orleans, by Rich Sacher. All About Louisiana Wildflowers , Jan W. Midgely. 298 pages. Publisher: Sweetwater Press (October 1, 2003). Louisiana Wildflower Guide , by Charles Allen, Kenneth Wilson, Harry Winters. 246 pages. Louisiana Wildflower Guide covers many of the common and some uncommon or even rare wildflower species. The 251 page book will be useful in identifying plants not only in Louisiana but also throughout the southeast from Texas to the Carolinas. More than 500 color photos are included and are the culmination of the years of photography by Ken Wilson. The text is a product of the lifetime botanical quests of Dr. Charles Allen. A set of charts that will narrow down your choices by several characteristics including flower color, habitat, leaf arrangement, and leaf type will facilitate the identification of genera. Generic and species descriptions are included and are detailed enough for usefulness but not too long and cumbersome. Tips for the identification of many species are included in the descriptions. For each species, the flowering dates, habitat, and distribution are given. A glossary, plant anatomy line drawings, and index close out the book. The Louisiana Iris: The Taming of a Native American Wildflower, 2nd Edition , from the Society for Louisiana Irises. 214 pages. Publisher: Timber Press, Incorporated; 2nd edition (September 1, 2000) This is a revised edition of the first complete reference published on Louisiana irises, the five species of iris in section Hexagonae. These beardless irises are endemic to the United States, with their center of distribution in Louisiana. They first drew attention because of the enormous number of their natural hybrids; this propensity for hybridization led to the development of today's spectacular range of colors and forms. These irises have proved adaptable to a wide range of soils and climates, needing only sun, ample water, and a more-or-less neutral soil to thrive. They can be grown in beds with annuals and other perennials, and many are happiest in boggy settings that recall their native swamps and marshes. They are now grown in temperate areas worldwide, and with their diversity of size, form, and color are suitable for almost any garden setting.